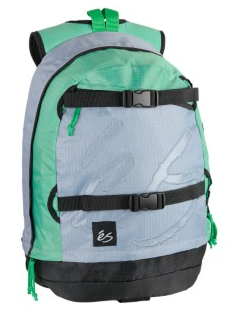 We are now able to offer ES Skateboard Backpacks from our partner site. The green, black and silver ES Endio skater bag is surprisingly spacious for its sleek design. It has comfortable shoulder straps and buckles for you to attach your skateboard. Made from 100% nylon, this bag has a stash pocket for your shoes and a large front pocket. Carry your deck and carry your gear on your back with this amazing backpack.